Effect and Mechanism of Fly Ash on Impact Toughness of Cement Stone CAO Dawei;Qinhuangdao glass industry research and design institute Co. Application of Single Drive High Pressure Roller Mill in the Treatment of Steel Slag, A New Technology for Utilizing Steel Slag GU Fali;Shandong Huate magnet technology Co. 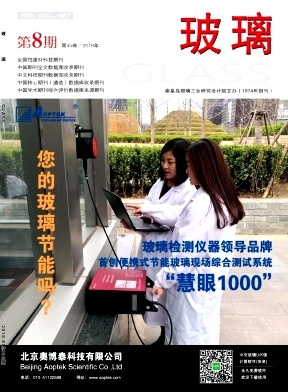 Application and Optimization of High Temperature Electric Dust Removal in Treatment of Flue Gas of Glass Furnace XIE Hui;ZHANG Yixian;LIU Zhihao;WANG Xiaofei;CHEN Yanxiong;Jiangsu Yijin environmental protection technology Co. Systematic Treatment of Tin Bath Drop YI Yun;LIANG Yexiong;LIU Yizhong;PU Shenggang;Dongguan CSG solar glass Co.
Effect of Molten Salt Composition on Chemical Toughening Properties of High Alumina Glass DAI Gan;ZHANG Zhenhua;MENG Qiang;WANG Subo;LAI Boyuan;Guangdong Avic Special Glass Technology Co. The Methods for Prolonging Service Life of the Film on Solar Control Coated Glass LIU Weidong;LI Wei;China Yaohua glass group Co.